The Dwingeloo Radio Telescope, then the world’s first and largest rotatable radio telescope for professional astronomy, now the largest radio telescope in the world for amateurs! 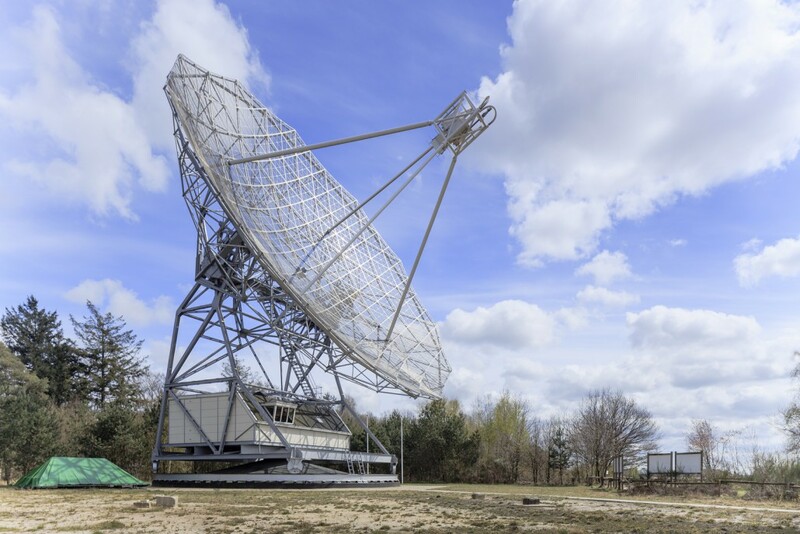 The Dwingeloo Radio Telescope, commissioned in 1956, is one of the oldest radio telescopes in the world. Until 1998, ASTRON used the radio telescope for scientific research of the Sun and the Milky Way. Due to a standstill, the telescope was damaged by rust, but enthusiastic radio amateurs were able to give the Dwingeloo Radio Telescope a second life. In 2007 they established the CAMRAS foundation and started to renovate and use the telescope again. In 2009, the radio telescope has been designated as a national monument, a unique monument from the post-war reconstruction period, and has been thoroughly restored from 2012 to 2014, including subsidies from the National Cultural Heritage Agency. The radio telescope is a unique construction weighing almost 130 tons and can be rotated horizontally (azimuth) over a circular rail track. The mirror is suspended in a tower of steel beams. With the motors and gearboxes at the top of the tower, the mirror can move in vertical direction (elevation). At the bottom of the tower is the revolving control house with engine room with gearboxes and observation room. The rail track and the main gear of 2.5 meters diameter are placed on a heavy concrete foundation. In the focal point of the mirror are the antennas and part of the receiving equipment. In the original version these were attached to a central mast. The mast was replaced in 1962 by a tripod and in 1974 by a four leg. With the Dwingeloo Telescope, the spiral structure of the Milky Way was mapped with increasing details on the 21 cm hydrogen line and high-velocity clouds were found. Research was done at other wavelengths as well. After the Westerbork Synthesis Radio Telescope came into operation, the Dwingeloo Radio Telescope observed the Sun and solar eruptions for a long period. In the 1990s, on a wavelength of 21 centimeter, a survey was done for galaxies behind our own Milky Way in an area where the extinction of light is very large due to dust. During that survey, a rather large galaxy has been found. Infrared observations confirmed this discovery. This galaxy is named Dwingeloo I, and a later discovered companion galaxy is named Dwingeloo II. Photos on the underlying pages are still to be posted.